This article includes resolutions to common issues that might be experienced when participating or connecting to a public webinar or product showcase. You do not have the sign-in/login details for the webinar. If you have already registered for the webinar and still have not received your sign-in details, please send an email to request this information. You cannot install the WebEx application. Please use the "Run a temporary application" option as an alternative method to launch the application ( open screenshot). Once the temporary application downloads, open it to enter the session. 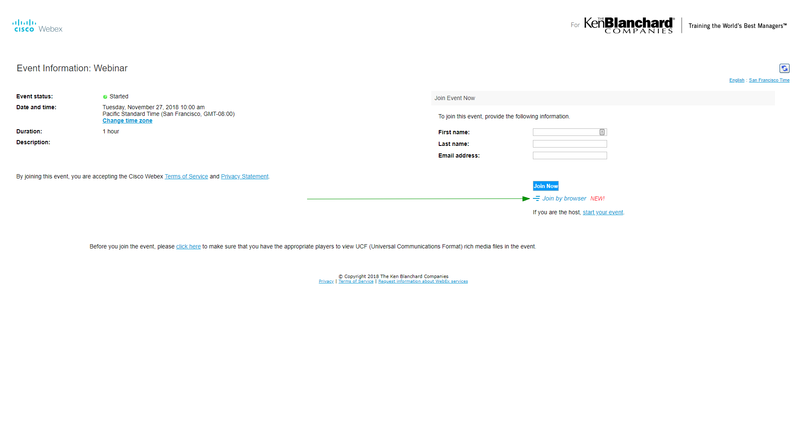 Alternatively, under the "Join" area, you can also separately select "Join by browser" ( open screenshot) depending on the web browser you're using which does not require any download/install. 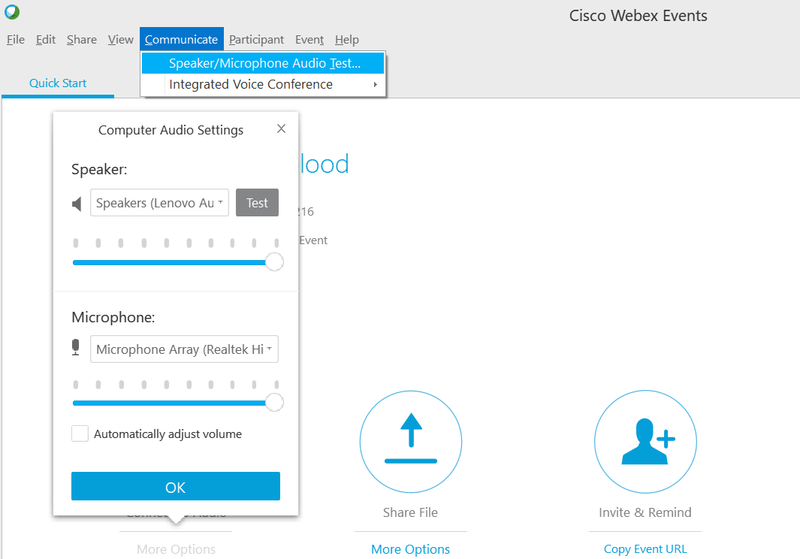 The WebEx application attempts to launch, but gets stuck in an indefinite loading loop. Close your web browser and re-open it, followed by attempting to access the application, again. If this does not resolve the issue, please attempt to launch from a different web browser (ex: Chrome, Firefox, etc...). 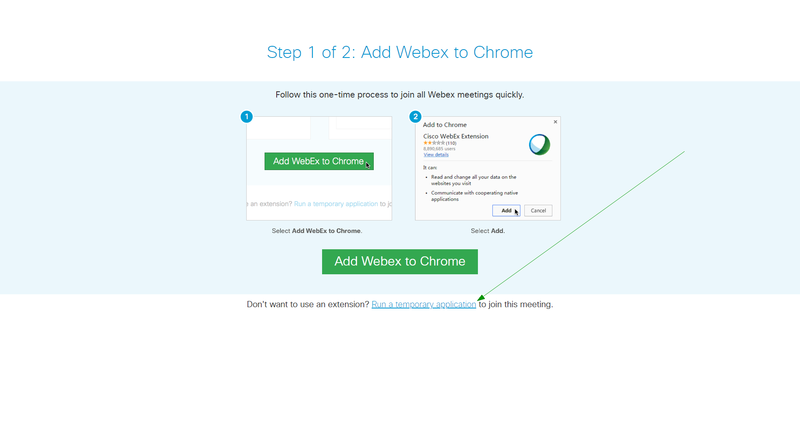 Alternatively, under the Join area, you can also separately select "Join by browser" ( open screenshot) depending on your web browser instead of using the WebEx application. You cannot hear any audio. Review the settings under "Speaker" ( open screenshot). If you have more than one audio device connected to your computer, you can select the drop-down menu followed by selecting the audio device and then by selecting "Test" option to test your audio, and also adjust your audio levels using the slider if needed. If you are using external speakers, please ensure they are powered on and the volume is turned up. The audio is choppy/broken up. If you are connecting to your organization's network through a VPN tunnel or proxy server, please disable the connection which may resolve the issue. Additionally, if you are connected to the internet over wireless, try switching to an Ethernet connection, if possible.